How to properly attach the thread and materials. 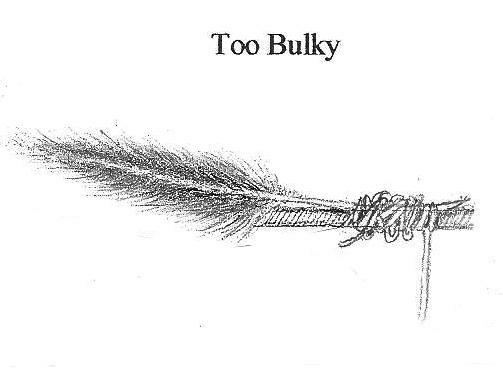 To ensure that materials will not slip and come apart, it’s important to tie them in neatly and tightly to the hook shank. 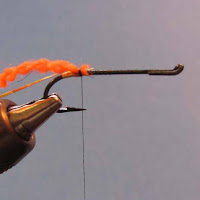 Hold materials between your thumb and forefinger and place the material on top of the hook. Then, pinch the thread and material and make numerous neat, firm wraps over the material to secure it. Loose wraps will cause the material to slip and pull out. Too many wraps will bulk up the shank making it difficult to attach other materials. Bulky materials such as large tinsels, lead wire, stems of feather quills and raffia will usually require a heavier thread like D thread, 2/0 Monocord, Kelvar and Nymo. Also, the ends of the heavier materials may have to be tapered so they can be smoothly attached. 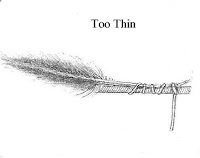 For most materials, lighter threads are easily attached and tapering is not needed. 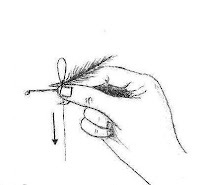 Illustrations of attaching thread and materials. David holding up meal for a raccoon?. The Deschutes River was in good shape and very productive. Everyone in our party had action, but most of the Steelhead were released since they were wild. My son David, however, had caught one nice 12-pound hatchery fish that we planned to have for dinner the next day. After the fish was cleaned, he hung it high on an alder branch to allow the evening air to set up the meat. It had been a very successful day. Our spirits were high and the camaraderie was enjoyable, but the long day had sapped our energy. After numerous jokes and stories, we headed for out tents. Suddenly, I noticed that David's fish was still hanging in the tree. Knowing that numerous varmints caroused around at night, I suggested that he take it down and put it in the cooler. However, he and his buddy decided to stay up a little longer to discuss the day's success and plan out tomorrow's strategies. The next morning, as everyone was preparing for the morning fishing, David suddenly blurted out, "All right, which one of you guys took my fish?" Everyone just shrugged their shoulders. 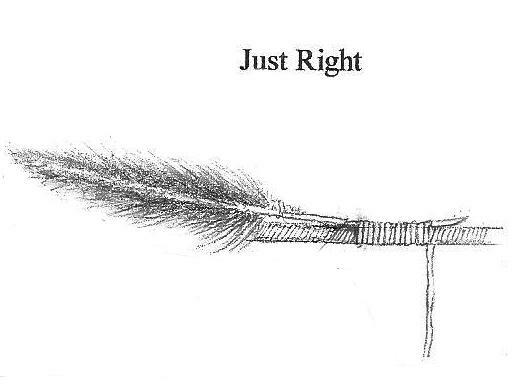 David started walking around looking for any sign of his fish, and I walked toward the branch where the fish had been tied and called out, "David, guess what? You just got ripped off by a thief in the night!" He asked what I meant and I responded, "Raccoons! They gnawed off the rope." We later found out that there were 13 intruders rummaging around out camp that night--a mamma raccoon and her 12 cubs. It was a good lesson, and for the rest of the trip everything was tightly secured. Story Behind the Dark Max Canyon Steelhead Fly and How to Tie It. 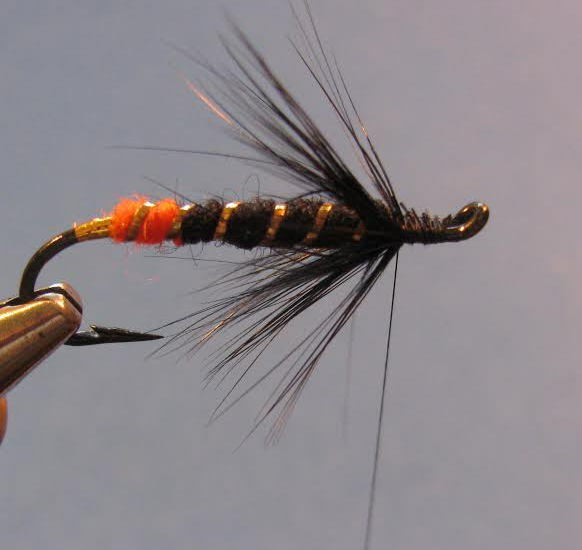 The Dark Max Canyon fly had its origin on the Deschutes River because of a chance meeting with an angler who wasn’t catching any Steelhead. I was fishing the west side of the river and having good success. In less than two hours I had landed and released five Steelhead. During that time the angler on the east side wasn’t having any luck, but I could tell that he was a good fly caster and was covering the water very well. When the sun finally danced across the water, I called it quits and rowed back to the other side. For the balance of the summer we began to fish together. He finally started to catch some fish but it wasn't because of what I said. 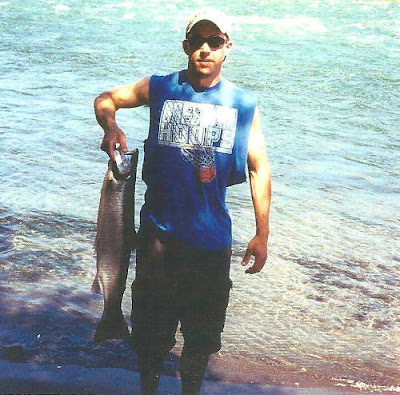 It was because of what I forgot to say which was that sometimes in Steelhead fishing you just have to get lucky. However, my original and seemingly harmless comment haunted him. When we would be talking with other anglers he would say, ”Here I was, watching this guy hook and release five Steelhead in a row, and when I asked for some solid advice, all he said was, “Keep on doing what you're doing.” I figured that meant, keep on getting skunked! 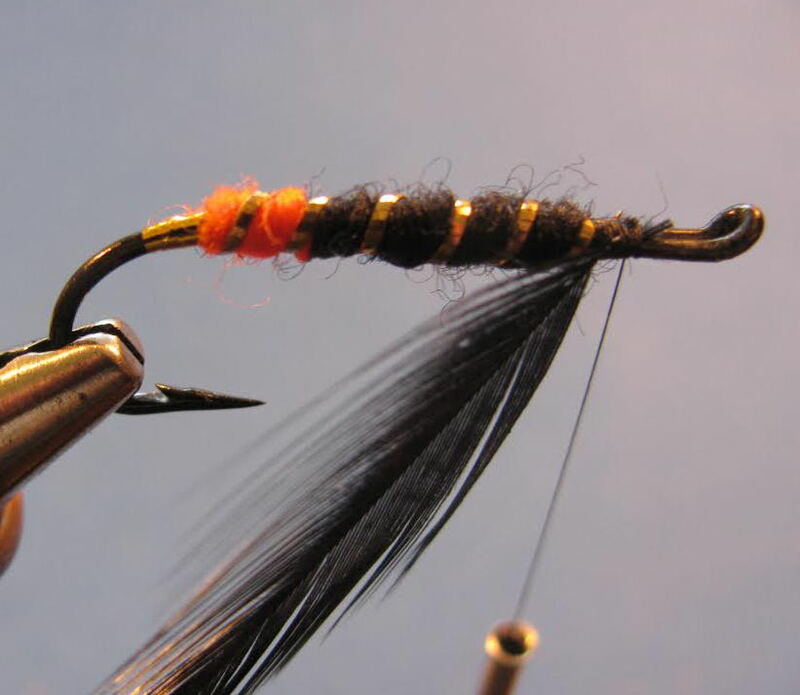 Sometime later, Larry tied a variation of the Max Canyon fly called the Dark Max Canyon. It’s a darker fly, has a lower profile and is effective in all water types. Here’s the recipe. Hook: Mustad 36890, sizes 4-6. Tip: Flat gold Mylar tinsel. Rib: Medium gold oval tinsel. Body: 1/3 orange & 2/3 black wool or yarn. 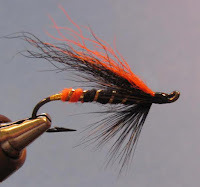 Wing: 2/3 black calftail with 1/3 orange calftail on top. above the hook barb. Attach the tinsel and orange yarn. Wrap the yarn up 1/3 inch and attach the black yarn. and tie off. Attach the black saddle hackle. Wrap the black hackle forward and tie it back to a 45-degree angle. Cut a clump of black calftail for the underwing and a smaller amount of orange calftail for the overwing and tie in the wing. Secure them tightly and complete the head. 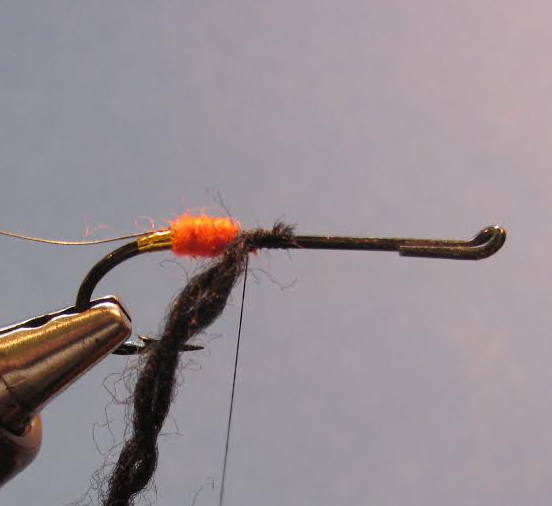 How to Tie the Zug Bug.